This year, it’s been even harder to separate fashion from politics,” said the comedian Seth Meyers, modeling an ankle-baring Thom Browne tuxedo without socks, as he pointed out, Monday night. Mr. Meyers was not starting his late-night monologue, but introducing the annual Council of Fashion Designers of America Awards at the Hammerstein Ballroom in New York, and that comment pretty much framed the evening. By the final presentation, honoring the feminist Gloria Steinem, Cecile Richards of Planned Parenthood and the singer and actress Janelle Monáe for their work in the Women’s March on Washington, almost every winner had made a statement of some kind. And not one about dressing Melania Trump. Diane von Furstenberg, chairwoman of the council, asked all of the immigrants in the room to raise their hands (there were a lot). 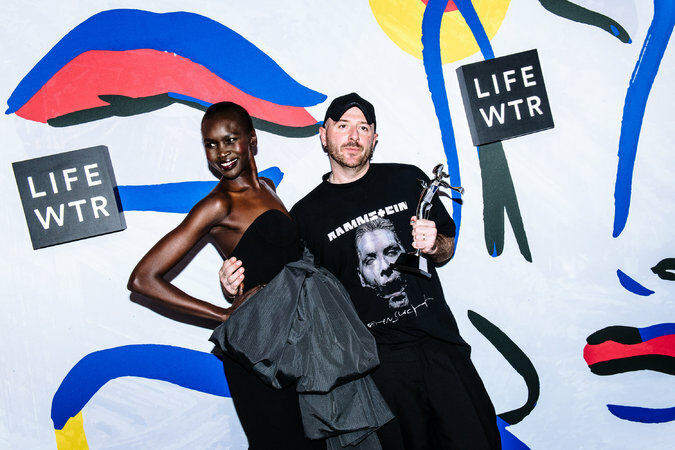 Pat McGrath, winner of the Founder’s award, said, “Fashion is an industry where the real insiders are all outsiders.” Kenneth Cole, recipient of the new Swarovski Award for Positive Change, said, “Thank you for recognizing a socially conscious business model and platform that I believe is so important in this time in which we are living.” And Ms. Monáe, whose rousing address pretty much brought down the house, riffed on Hillary Clinton’s “women’s rights are human rights” speech: “L.G.B.T.Q. rights are human rights; immigrant rights are human rights; minority rights are human rights,” she said. Yet the most striking elements of the evening weren’t the words, but the winners themselves. Although Steven Kolb, chief executive of the CFDA, urged gala attendees to look around, because “tonight you will find American creativity everywhere,” in fact, most of the creativity being honored was not American. I say that not as a pejorative, but as a point. The three major awards of the evening — for Designer of the Year in women’s wear, in men’s wear and in accessories — went to foreign designers who had landed atop storied American houses and, through their ability to view the old narrative in new lights, revived them. 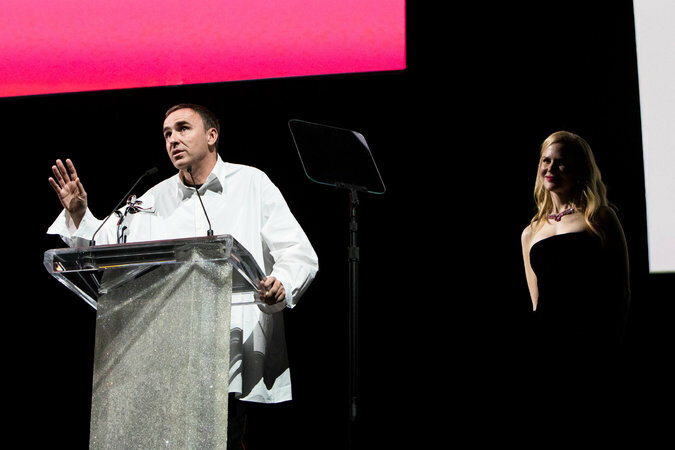 Raf Simons, the Belgian designer who took the helm at Calvin Klein in August and whose first show took place in February (and was an ode to the melting pot of Stars and Stripes history), won both the men’s and women’s categories. Stuart Vevers, the British designer who has taken Coach on a trip down Route 66, was named accessory designer of the year. Ms. McGrath, by the way, is also British. Then Franca Sozzani, the legendary editor of Vogue Italia (and, yes, an Italian), who died in December at age 66, was given the Fashion Icon award, a prize previously won by Beyoncé, Rihanna and Johnny Depp. And Demna Gvasalia, a Georgian designer based in Switzerland and showing in Paris, won the International award for his work at Vetements and at Balenciaga. Even Fernando Garcia and Laura Kim of Monse, who won the Swarovski Award for Emerging Talent, were born and raised elsewhere before moving to the United States for school and starting their business in the country (as well as becoming the creative directors of Oscar de la Renta). And Rick Owens, who received the Lifetime Achievement Award, is American, but he lives and works in Paris. In other words, if ever anyone wanted to make an argument for the importance of immigration, of cross-border fertilization, of the absence of walls and of the renewal and rebirth that comes from an outside perspective, they could do worse than to turn to the 2017 CFDA awards. A lot has been written (and I have complained a lot) about the repetitive nature of these events, which often feature the same names, year after year. Of those in contention for women’s wear designer of the year, for example, all except Mr. Simons had won at least once before — some of them multiple times. That’s a problem — unless it is solved by broadening the definition of what constitutes “American,” opening the doors and welcoming different players.